HW 220 is a professional DC welder with capacity of 220 Ampere powered by hydraulic motor, it can also be used as generator three single phase. The tool can be powered by the circuits of sky lifts, excavators, trucks, mobile service vans and all machines with sufficient hydraulic capacity. 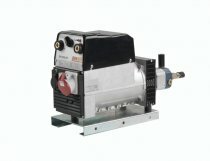 The hydraulic functioning gives many advantages: quietness, safety, versatility, easy transportability, robustness, absence of vibrations and exhaust smokes, minimal maintenance necessity. HW 220 increase the versatility of the machines, its use is ideal when is needed to obtain current and to weld anywhere at low cost.